Heat oven to 350°F. Spray 10-inch springform pan with cooking spray. Make brownie batter as directed on box for basic recipe; spread in pan. Bake 28 to 30 minutes or until toothpick inserted 2 inches from side of pan comes out almost clean. Meanwhile, in large bowl, beat cream cheese and sugar with electric mixer on medium speed until smooth and creamy. Beat in pumpkin until well blended. On low speed, beat in eggs 1 at a time, just until combined. Stir in vanilla and pumpkin pie spice. Reserve 1/2 cup filling in small bowl. Pour remaining filling over baked brownie base. Stir melted chocolate into reserved filling; place chocolate in large resealable food-storage plastic bag. Seal bag; cut off 1 corner of bag. 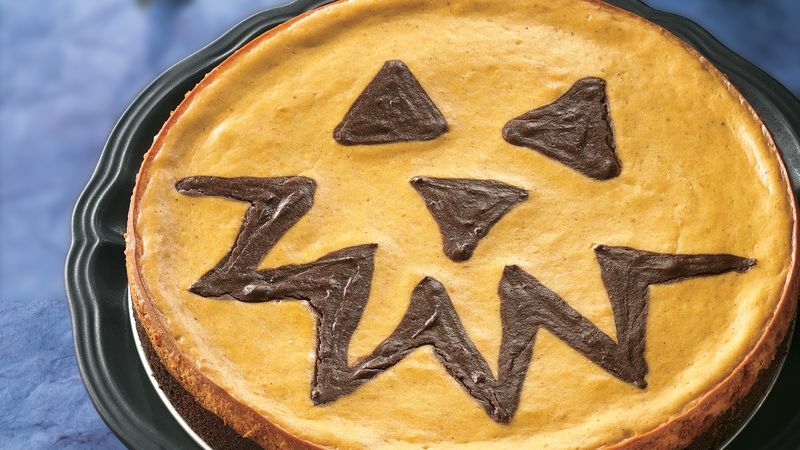 Squeeze bag to pipe jack-o'-lantern face on cheesecake. Bake 40 to 45 minutes or until center is almost set. Cool 30 minutes. Run knife around edge of pan to loosen cheesecake. Cool 30 minutes longer. Refrigerate at least 2 hours before serving. Cover and refrigerate any remaining cheesecake. Using dark chocolate chips in the filling will give this cheesecake a richer chocolate flavor.